Mega Tiny Corporation is a company that has developed a case for some of the smart phones. This case is available for purchase on Amazon. A case is like a cover to the smartphone. The case made by Mega Tiny has special quality to stick to any non-porous surface like glass, tiles, metal, wood, computer body and computer screens, non-porous walls, car surfaces, steel surfaces, wooden and metal doors and windows etc. The case is, however, currently only compatible with some of the most popular Apple iphones, and Samsung Galaxy phones only, like iphone 6, iphone 6s, iphone 6 plus, iphone 6s plus, iphone SE, iphone 5, iphone 5s, Samsung Galaxy S6 and Samsung Galaxy S6 edge. So, before you purchase, you need to make sure this case is compatible with your smartphone. 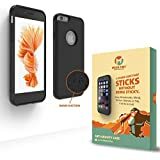 Once your iphone is fitted into this anti-gravity case, it can stick to any surface as mentioned above, and that is the beauty of this product. You may have the fear, that it may fall after sticking for some time, but that is not the case as the product is fully tested and works perfectly fine. Here is a nice video review of this product from the company itself. However, this case may not stick to some of the porous walls, made from concrete blocks, and things like sand, dirt, gravel, fabrics and paper which are porous in nature. Since the case can stick to even non-metallic surfaces, we call it as anti-gravity case, and this has been made possible through nano-suction technology used on the back of the case. One can imagine millions of tiny suction cups providing grip to most smooth, flat surfaces. This is not like a magnet which can only stick to iron, nickel or cobalt made products. The iphone with this Mega Tiny case is useful in many ways in everyday life. Suppose your mom is cooking something in the kitchen, using a recipe, that is stored in your iphone. To make things easier, what she can do is to stick the phone in front of you, on the tile made wall or wooden cardboard in the kitchen, and start working with both hands for cooking. All the ingredients of the recipe can be watched easily, as its exactly in front of you, and that way you don't need to touch the phone with your food indulged hands. This saves you from lot of hassles. Again, suppose you are watching a live football, or cricket match on your iphone, but you also need to shave your beard at the same time. What you can do is to simply stick the phone in front of you on the mirror, through which you are seeing yourself, for the shaving. That way you can watch the match even while shaving. So there are many ways this anti-gravity case could be useful in everyday life. Now you don't even need a selfie stick after having this wonderful case. This could even be a great gift for someone who is fond of taking selfie. Selfie stick is also a great way to take a selfie, but its not useful in other ways, like I mentioned two examples above. If you don't know what selfie stick is, you can watch this youtube video for a wonderful selfie stick product and its functioning. However, selfie stick cannot be replaced by Mega Tiny case, when sometimes, you are at a remote place (like a hill station) where there is no any nearby vertical support to stick the case. At that moment, you only need a selfie stick to take a selfie. 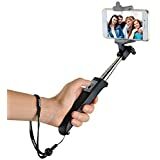 If you want to buy a selfie stick instead of the case there is one with best selling on Amazon. Here is the picture of this selfie as below. Use this cube shaped device to charge phone, use as torch, use as stand, use to hold keys, memory card slot, theft protection and more.